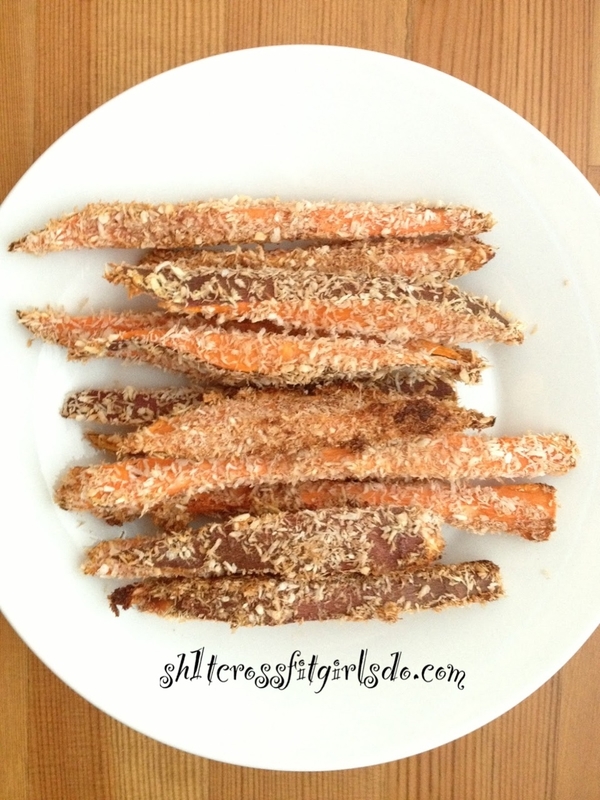 Kick your sweet potatoes up a notch by adding some yummy coconut and cinnamon! 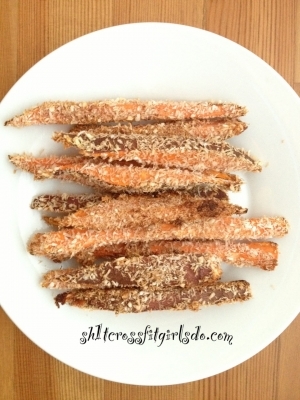 These delicious fries are baked, not fried, and make for a perfect side dish or even a healthy dessert. Serve with a little honey or maple syrup to curb a sweet tooth! 1. Preheat oven to 400 degrees, line a baking sheet with foil, and spritz with non-stick spray (I used coconut oil spray). 3. Put your egg whites in one bowl, and mix together your cinnamon, coconut, and Truvia in another bowl. 4. Time to dip! This will get messy, people. Dip your spears into the egg white mix, then dip into the coconut mix. Be sure to get them coated all over! 5. Lay them out on the cookie sheet. 6. Once done, spritz them lightly with the nonstick spray. If desired, VERY lightly sprinkle salt on them. 7. Bake for 20-30 mins until desired doneness. I like mine kinda burnt, heh.